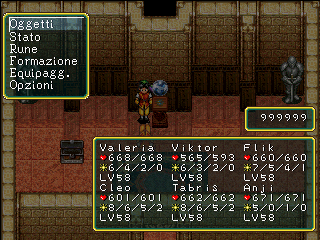 Suikoden and it’s sequels are just about the bona fide definition of cult classic. The translation is a little rough around the edges, there are bugs, but man there’s a great game in here that shouldn’t be missed. You are a son of a great general in history, just beginning your career in service to the empire. While your father is fight in the north things go seriously wrong and corrupt in the current ruling power, you are exiled and the time comes to overthrow the Scarlet Moon Empire! The whole series focuses on the tragedies of war and revolution, and comes out as usually a great story with good villains. 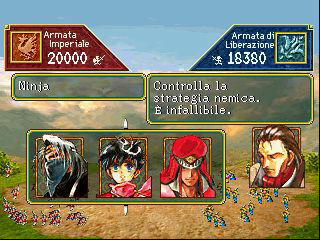 The Suikoden games are well known for having 108 recruitable characters of all kinds, and while not all of them are playable the majority are. A good amount of them have secret ways of recruiting, and with some the challenge is in keeping them alive in the war! 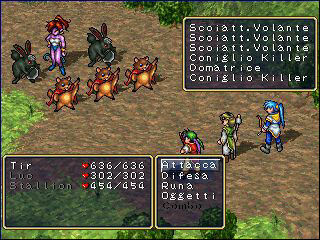 Unlike other games with loads of characters such as say, Chrono Cross, your party can hold up to six characters so there’s opportunity to use them. There is also a bit more of an element of strategy, as both characters and enemies fight in rows which limit who can be hit and who can’t. Spells are done by runes, which is a little similar to the Magicite system in that you learn what’s on the rune gradually. 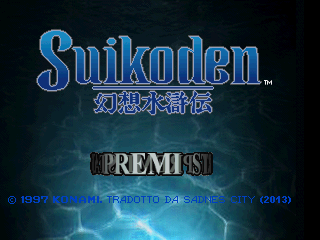 Suikoden was an early title when talking about JRPGs on the PS1. As such the visuals aren’t as much to look at and can resemble an SNES game, though there are some things obviously only a hardware upgrade to the PS1 can do. Everything still looks great however and probably would’ve been top-notch on that system, every character at least stands out and everything is quite detailed considering. The sounds can also be a little strange at times due to possibly lower budget audio, using oddities like an elephant’s trumpet for a dragon’s roar, but it’s not anything that hugely detracts from the game. What can detract however are bugs, such as being able to exploit Bribe and some Earth spells not doing anything. That’s about the worst of it however and just about everything else is pretty stable; it’s usually it’s sequel that’s known to be buggy all over. 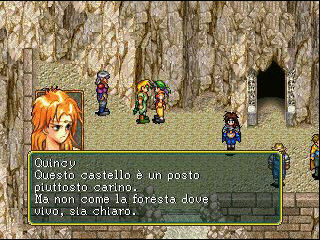 All in all, Suikoden is an SRPG that shouldn’t be missed. Fans of games such as FFVI would feel right at home here, and may even enjoy it more than such a large classic. Complete English to Italian translation (both text and graphics). The translation features multiple ASM hacks, such as a new RLE compression for graphic files and a DTE encoding for dialogues and menus. Also, the patch inserts the japanese Saturn opening into the PSX version. The patch provided on Romhacking.NET only works with the UK PAL version of the game. To get the patch for the USA version, go to SadNES cITy! There are three versions of the game which can be patched: the PAL UK, the old NTSC (1996) and the new NTSC (1997). There is a specific patch for each version.